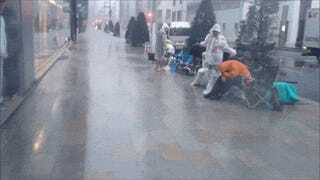 Today a powerful typhoon bringing heavy winds and torrential rains hit Japan. Flash flood warnings hit parts of the country and in certain areas, people were ordered to evacuate. This was serious stuff. So, how the hell are you supposed to wait for a new iPhone? Since mid-last week, Apple fans have been lining up on Tokyo's Ginza for the latest iPhone. Right before the typhoon hit Tokyo, the handful of people lined up were moved into the Apple Store to take refuge. Above, you can see a clip of those in line being moved into the empty Ginza Store, which hadn't opened, at a little after 7:30am. There, they were allowed to bring in their wet possessions, rest in the Apple Store theater until 10am, and were even given bottled water. "I was so moved how Apple treats its customers," said YouTube user AppTaylor. Hey, who says Apple doesn't care about its customers?